Summary: It took MTVW’s chief exec just 265 words to describe the group’s weakest first-half performance for four years. Still, the nature of this property-trading firm means earnings can be somewhat variable from time to time. What is important, though, is that net asset value improved once again to a fresh high while debt continues to be reduced to a new low. My sums point to a possible NAV of £209 per share based on the firm’s long-term margin. I continue to hold. I was not expecting these results to reveal MTVW’s lowest first-half revenue and profit figures since November 2013. Revenue dropped 3% while profit dived 16%. Perhaps the lower revenue and profit were simply due to the lower prices MTVW achieved from its property sales. That said, MTVW’s general style of property trading can also lead to haphazard earnings. To recap, MTVW’s portfolio is dominated by 2,000 or so regulated-tenancy (or similar) properties, and the number of the group’s properties becoming available for sale — and the proceeds they generate — can be unpredictable. You see, MTVW sells its properties only when the regulated tenancy ends — which most often occurs when the tenant dies. Furthermore, the gain on each property sold — typically correlated to how long the property has been owned by MTVW — can vary somewhat as well. Anyway, I suppose all that may have effected today’s results, too, and led to the 63% gross margin, also the lowest for four years. For some perspective, a 63% gross margin is equivalent to MTVW selling a property for a 170% gain. The group enjoyed a 199% gain last year, and has earned an average 166% gain during the last ten years. Although MTVW’s H1 progress was not the best, it did add a net £11m to the balance sheet to take the net asset value (NAV) to a fresh £347m/£89 per share peak. I wrote in my review of MTVW’s 2017 results that group borrowings then stood at their lowest level since 2007. These results showed net debt having reduced by a further £6m to £25m — now the lowest level since 2001. Net debt of £25m equates to just 7% of the £346m book cost of MTVW’s trading-property estate. In the past this ratio has often topped 25%, which suggests MTVW could have the capacity to borrow another £60m. Similar to the volume of property sales, the volume of property purchases can also vary from period to period. I guess it depends on how many regulated tenancies come onto the market at a reasonable price at any one time. 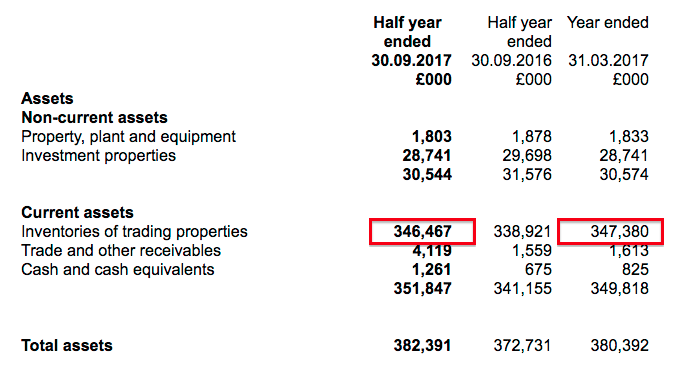 For comparison, I calculate MTVW spent £33m on additional properties during the whole of the last financial year. I can only trust these recent London purchases are indeed the “right properties”. Yet that was the case today with this MTVW RNS. I am not 100% sure what has happened behind the scenes here, but I attended the 2014 AGM and it was clear certain members of the wider Sinclair family do not get on with each other. In particular, Graham Murphy — whose wife Mrs M Murphy is the sister of chief exec Duncan Sinclair — was quite vocal with his criticisms of how MTVW was managed. The votes against the non-exec at the 2017 AGM represented 21% of the share count — the Murphy family owns at least 18%. I may have got this completely wrong, but it seems to me the Murphy family voted against the non-exec resolution… perhaps because they wish to have a non-executive position on the board themselves. I dare say I’d want a seat on MTVW’s board if I owned 18%. This RNS revealed trading properties with a £346m book value, which could yield £922m if they were all sold at the average margin enjoyed during the last ten years. Tax the resultant gain at 19% and then add on other freehold investments of £29m, and then subtract net debt of £25m and other liabilities of £3m, a possible net asset value (NAV) comes to £813m or £209 a share. That £209 per share estimate compares to the aforementioned £89 per share NAV reported by MTVW on its usual historical-cost basis. With the share price at £112, clearly there remains some upside potential here. But as always, the great unknown is how long it will take MTVW to sell all of its properties to realise that potential £209 per share NAV guess. This £666m valuation is becoming rather stale now, but for what it is worth, adjusting this valuation for tax, the investment properties and debt gives an NAV of £154 a share. As a reminder, this £154 estimate is based on MTVW’s properties being in their current regulated-tenancy state — so does not include any upside potential for when the property is vacated and can be sold at market value. And as before, this £154 estimate does not include any house-price gains experienced since the September 2014 assessment, and nor does it adjust for properties bought or sold thereafter. Meanwhile, the interim dividend was held at 200p per share and leaves the full-year 300p per share payout to provide a 2.5% income. PS: You can now receive my Blog posts through an occasional e-mail newsletter. Thank you for another excellent commentary. Whilst all of us investors like to look closely at property realisations, because that is what produces the profits and dividends that we are all interested in, the company always emphasises the importance of its acquisitions. And because we are given no detailed information on the acquisitions it is impossible to comment sensibly. I like the consistency of the dividend, the conservative dividend cover and the low gearing ratio. This is a great share to tuck away for the long term. Thanks for the note. Yes, there are no real details on acquisitions. The annual report gives a some information, but it is limited to the number of unit types purchased, and their total cost. I agree this is a great business to tuck away. The note states MTVW sold properties for £22,496k that were valued by Allsop at September 2014 at £14,767k. So the market premium over the Allsop valuation was 52% for this H1. For H2 2017, the premium was 53%, for H1 2017 it was 43% and for FY 2016 it was 44%. This info supports my valuation sums in the Blog post above. The Allsop valuation gave MTVW’s estate a £666m value at September 2014, at which point it was in the books for £318m. MTVW’s latest accounts showed the estate had a book value of £346m. That figure suggests the estate’s real market value could be (666/318)*346*1.52 = £1,101k. 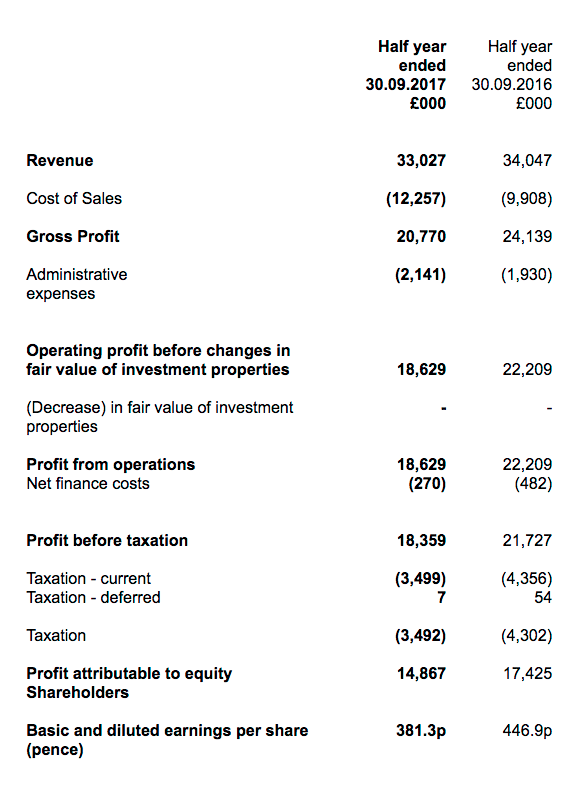 However, I would temper that valuation because, since the Allsop valuation, MTVW has sold property with a £60m book value and bought property with an £89m book value. So various adjustments have to be made for those changes. Anyway, to keep a long story short-ish, I have worked out that perhaps the estate could be valued at £958m given the 52% premium and the estate movements since the Allsop valuation. Less the possible tax and debt, and plus the other property investments, I arrive at a potential book value of £843m or £216 a share.